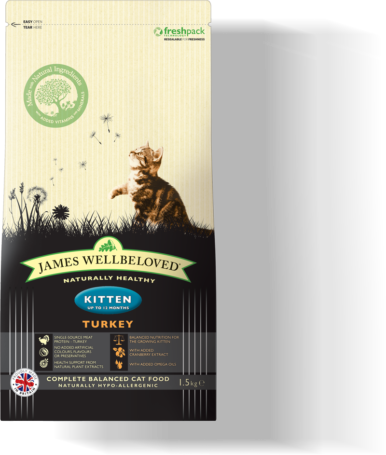 Using all our knowledge and experience, we’ve created James Wellbeloved Turkey Kitten food. 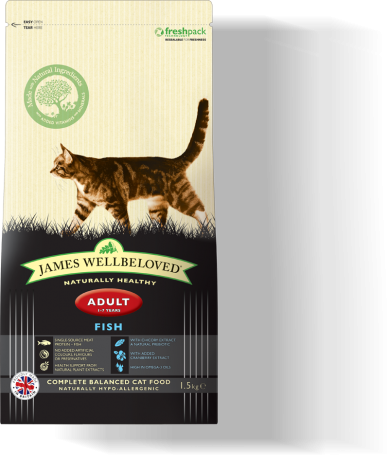 We take a handful of ingredients from nature, one source of animal protein and combine them with all the vitamins and minerals your kitten needs. And all the great taste it deserves. For added peace of mind, it’s naturally hypoallergenic so less likely to cause an adverse food reaction and you will never see any added artificial colours, flavours or preservatives. Not now, not ever. Additives per kg: antioxidants: E306/Natural antioxidant, 168mg, Vitamins: E672/Vitamin A, 30,000 iu, E671/Vitamin D3, 1400 iu, taurine, 1000mg. Trace elements: E1/iron, 133mg, E2/iodine, 2.7mg, E4/copper, 20mg, E5/manganese, 40mg, E6/zinc, 385mg, E8/selenium, 0.37mg.